Down to their final strike trailing 6-5 in the ninth, the Red Sox delivered back-to-back doubles to tie the game and send it to extras. From there, Drew Hedman launched a towering two-run bomb over the right field fence to give Salem an improbable victory over Frederick, 8-6 in 10 innings. Keury De La Cruz went 3-for-5 in his Carolina League debut, including a gigantic double to drive in Heiker Meneses to tie it up with two outs in the last of the ninth. 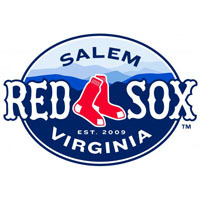 The Salem Sox have now won three in a row and five of their last six. The game-ending blast was Hedman’s second walk-off homer of the season. Nearly two months ago on June 30, Hedman belted a solo shot in the bottom of the ninth to ignite a celebration in Portland’s 4-3 win over Trenton. On Wednesday night, he helped Salem improve to 18-4 on Wednesdays on the year, crushing a Zach Fowler offering over the wall in right for his fifth Carolina League home run of the season, his ninth home run overall. Brandon Jacobs had singled off Fowler to start the inning, and Hedman quickly ensured that the bonus baseball would not last much longer. Tyler Townsend’s solo homer gave Frederick a 6-5 lead with two outs in the top of the seventh, culminating a topsy-turvy stretch in the middle innings. Salem led 3-0 after three, using five singles to rally for the three spot, but the Keys got on the board with one in the fifth and then capitalized on a huge Red Sox error to score four times in the top of the sixth. Keith Couch fielded a potential inning-ending double play ball at the mound and fired low to second, with the throw skipping away and preventing the Sox from getting any outs. Four of the next five Keys’ hitters recorded base hits to send Frederick in front 5-3. But one mistake deserved another, and in the last of the sixth, Garabez Rosa fired errantly to second on a grounder that could have been an inning ending fielder’s choice. The runners on first and second both scored and Salem snagged a pair of unearned runs to tie the game at five. The Keys used three pitchers to face four Salem hitters in the eighth, and the Red Sox offense came up empty. But with two outs in the last of the ninth, Heiker Meneses doubled on an 0-2 pitch from David Walters, lacing a grounder off the glove of third baseman Travis Adair. De La Cruz followed with a looping liner that squeaked inside the foul chalk down the left field line and evened the game at six. Two batters into the tenth, Hedman delivered the knockout blow. The homer made a winner of Andrew Jones, who tossed two scoreless innings to improve to 5-4. Zach Fowler, the sixth Keys pitcher of the game, suffered the loss, dropping to 0-1.